It’s easy to look at Andy Warhol's breakout Campbell's Soup Cans and think, "What's to know? It's cans of soup." Critics certainly did. But that’s just one of the bumps Warhol’s work hit on its path to becoming iconic. 1. IT’S NOT AS REPETITIVE AS YOU MIGHT THINK. At a glance, Campbell's Soup Cans looks like a series of repetitions of the same can on similar 20-inch-by-16-inch canvases. But the reason Warhol cranked through 32 different canvases can be found on closer inspection of the names on both the cans and the paintings. (Tomato, Clam Chowder, Black Bean…) Warhol created a portrait of every non-frozen Campbell's soup flavor available to him in 1962. 2. WARHOL BECAME A MACHINE TO MASTER HIS VISION. After buying every kind of can at his local grocery store, the eccentric artist projected each can onto a canvas. Each time he carefully traced out their finest details. Then, the 33-year-old meticulously filled in his outlines, hoping to mimic the mechanically reproduced look of the original labels. 3. WARHOL’S PROCESS WASN’T PERFECT. Warhol used a hand stamp to keep the fleur-de-lis pattern that lines the bottom of each can consistent. But his placement varied from canvas to canvas. Similarly, the hues of red and white vary slightly, and one soup can is missing the gold band. But some critics have argued these human touches amid attempted uniformity are what make Campbell's Soup Cans so compelling. 4. THE PAINTINGS’ GALLERY DEBUT ALSO PULLED INSPIRATION FROM THE GROCERY STORE. While visiting the Pittsburgh-born provocateur in the midst of Campbell's Soup Cans' production, art dealer Irving Blum was so impressed that he offered Warhol a show at the Ferus Gallery in Los Angeles. Blum staged the series of soup can paintings on grocery store shelves that lined the length of his groundbreaking gallery. 5. THE PAINTINGS MADE HISTORY. Not only was the Ferus Gallery show Warhol's first solo exhibition of pop paintings, it was also the first time Pop art had been displayed on the West Coast. No matter what the response was, this was a history-making event. 6. THE CRITICS WERE HARSH. The Los Angeles Times wrote of the exhibit, "This young 'artist' is either a soft-headed fool or a hard-headed charlatan." Essentially, Warhol's cans reignited the age-old debate about art versus commercialism that plagued Pop art in the early 1960s. 7. OTHERS OPENLY MOCKED THE WORK. One art dealer down the street from the Ferus crudely lampooned Campbell's Soup Cans by stacking actual soup cans in his gallery. To add insult to injury, the enterprising art troll promoted the event by advertising that at two for 33 cents, his cans were cheaper than Warhol's, which were selling for $100 each. 8. THE INITIAL SALES STRATEGY WAS SHAKY. Though the rising artist had already been featured in a Time magazine article with the likes of American Pop pioneers Roy Lichtenstein, Wayne Thiebaud, and James Rosenquist, Blum advised Warhol to set a "low price level during initial exposure." This plan did help sell five of the 32 paintings. But Blum soon realized selling the cans individually would destroy the power of the pieces as an ensemble. To correct the situation, he reached out to all the owners, including movie star Dennis Hopper, and bought back all of the sold pieces. Then Blum offered Warhol $1000 for the lot, which Warhol accepted. 9. KEEPING THE CANS TOGETHER CEMENTED THEIR LEGACY. Reflecting back on Campbell's Soup Cans, the BBC credited Blum's grouping of the 32 canvases as the cause for the public's shift from apathy to excitement over the series. "This made it different; it made it a statement," journalist Sara McCorquodale wrote. "The work seemed to speak of the spirit of a new America, one that thoroughly embraced the consumer culture of the new decade. Before the end of the year Campbell’s Soup Cans was so on-trend that Manhattan socialites were wearing soup can-printed dresses to high-society events." 10. CAMPBELL’S BECAME A WARHOL STAPLE. Campbell's Soup I, Campbell's Tomato Juice Box, Small Torn Campbell's Soup Can (Pepper Pot), Campbell's Soup with Can Opener and Crushed Campbell's Soup Can (Beef Noodle) are just a few of the variations Warhol created on the theme. 11. THE WORK EVENTUALLY LAUNCHED WARHOL’S CAREER. His first solo exhibition was considered a flop, but Warhol was undeterred: He continued to churn out pop art inspired by Campbell's soups and other pop culture-inspired pieces. And the critical and public opinion began to turn in his favor. By October of that year, The New York Times was proclaiming his pieces satirical. The debate over his work raged on, but by the 1964 exhibit The American Supermarket, which took place on the Upper East Side of Manhattan, Warhol was asking for $1500 for one of his other soup can paintings, a steep increase from his Ferus days. Art historians now regard the L.A. show as Warhol's breakthrough. The New York exhibition was just when the rest of us caught up with him. 12. WARHOL HAD THE LAST LAUGH ON THOSE WHO HAD MOCKED HIM. The American Supermarket sold actual cans of Campbell's Soup autographed by the artist. The show's invitation blithely marketed their sale: "3 for $18, $6.50 each," a 2900 percent markup over what an unsigned can would cost in a traditional supermarket. 13. BLUM CASHED IN WHEN HE SOLD THE SOUP CANS. 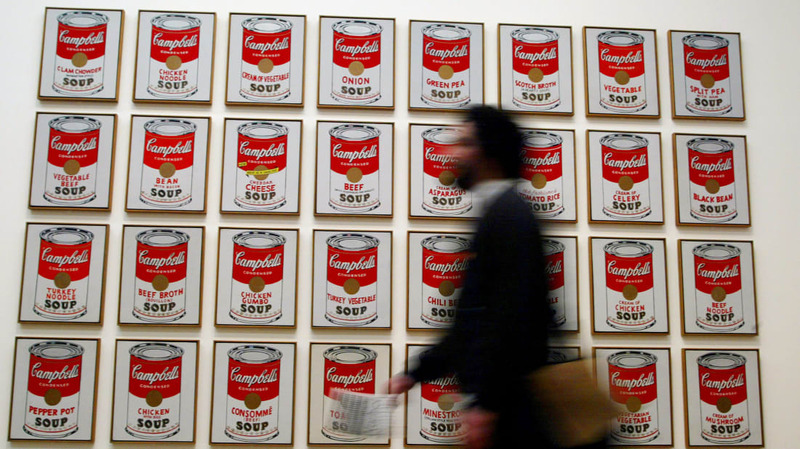 Once he acquired the Campbell's Soup Cans, the curious art collector kept them for 34 years. During this period, he witnessed the rise of Andy Warhol, suffered the pain of the artist's unexpected death in 1987, and held onto the paramount pieces for another nine years before selling them to New York City's Museum of Modern Art for upwards of $15 million. 14. THE MOMA CHOSE TO DISPLAY THE CANS IN A NEW WAY. Instead of mimicking Blum's grocery aisle approach, the museum hung the canvases in a grid formation. They were arranged in chronological order of the introduction of each Campbell's soup flavor, beginning with 1897's Tomato on the top left. Recently, though, the museum has moved Tomato to the bottom and given Manhattan Style Clam Chowder pride of place. 15. WARHOL SINCERELY LOVED CAMPBELL’S SOUP. He famously said, “I used to drink it. I used to have the same lunch every day, for 20 years, I guess, the same thing over and over again.” He had internalized the soups both literally and metaphorically. Warhol's admiration of how the uniformity of each flavor was consistent from can to can inspired him to turn to photo-silkscreen printing following Campbell's Soup Cans's creation. This technique would become a signature of the artist's unique brand, including his iconic portraits of Marilyn Monroe and Jacqueline Kennedy. 16. CAMPBELL’S LOVED WARHOL RIGHT BACK. Warhol made the pantry staple feel cool, and Campbell’s appreciated the favor. In 1966, the company paid homage to Campbell's Soup Cans with a limited edition dress. For just $1 and two can labels, a soup-loving fashionista could sport the paper Souper Dress. Today, these paper dresses can fetch upwards of $7500.